The WFM5000 and WFM4000 Compact Video Waveform Monitors provide an ideal solution for basic video and audio monitoring needs with an integrated LED backlit display in a convenient 3RU, half-rack, short-depth form factor, suitable for space-constrained environments. These versatile instruments provide options to accept power from a 12 V DC source, a battery, or a 100-240 V AC converter. 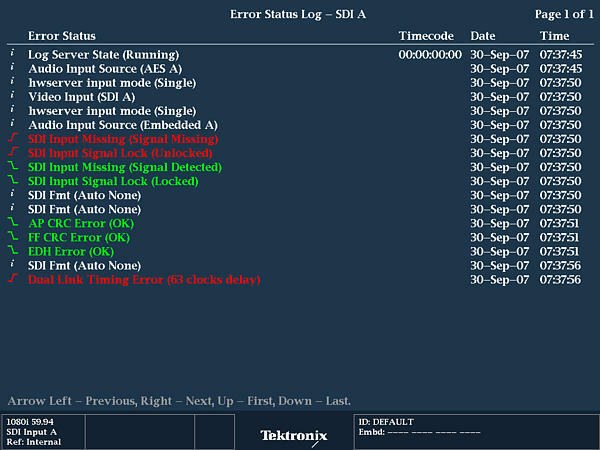 Supports SD-SDI (ITU-R BT.601) monitoring only. These instruments provide the reliability of the Tektronix waveform monitors family in a portable, basic monitoring product. The intuitive user interface provides backlit buttons, and online help. 32 user-configurable presets allow users to recall commonly used configurations tailored to your personal work practices. These presets can be transferred to and from other units (same model) using the front-panel USB port. The Passive loopthrough inputs allow for transparent monitoring at any point of the signal path even if instrument power is off. An Ethernet port allows for easy download of screenshots and the Error log. Tektronix displays offer the sharpest CRT-like trace quality for clear waveform monitoring with the look and feel of an analog display. With several sweep rates and easy control of vertical gain and horizontal magnification, you can efficiently monitor and measure video waveform parameters. The vector display offers user-selectable graticules, color target, and color axis. 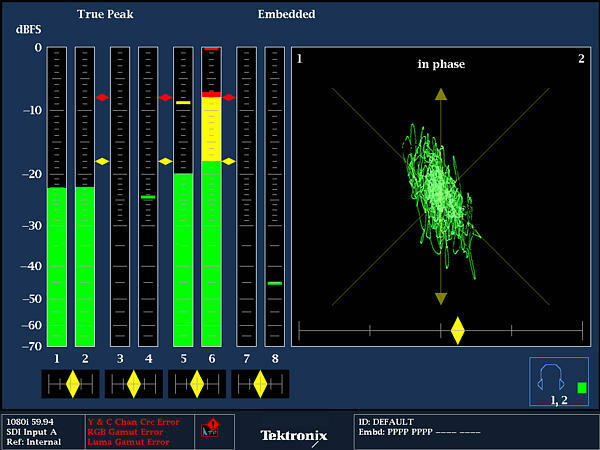 The patented Tektronix Diamond and Split Diamond displays enable Colorists, Editors, and Operators to visualize whether the content is RGB Gamut compliant with a single glance. Plus, they are designed to help isolate the Out-of-Gamut component just as easily. For SDI component content that is destined for broadcast in composite systems, the unique Tektronix Arrowhead display can be used to monitor Composite Gamut compliance without the need for a separate encoder. Within this display, a separate upper and lower luma-only Gamut limit can be applied. This display is very useful for camera balancing. Each of these displays offers user-selectable Gamut thresholds so Operators can set monitoring limits appropriate to their specific operation. In addition, Gamut monitoring is fully integrated with the powerful alarm logging and reporting capability of the WFM5000 and WFM4000. TandemVu provides the ability to visualize waveform and vector or lightning displays simultaneously. Each trace can be positioned and magnified individually based on the user's preferences. TandemVu provides broadcast operators with an efficient way to adjust and balance cameras in studios or outside broadcast applications. 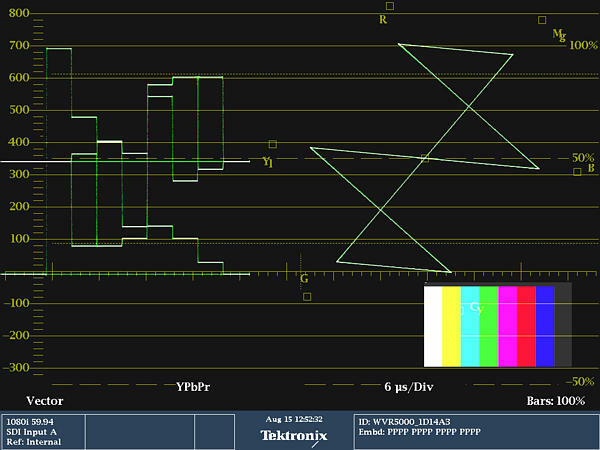 The Tektronix displays provide sharp traces without pixelation. The waveform display can be presented on parade and overlay modes in RGB, YPbPr, YRGB, or pseudo-composite formats. Both fixed and variable vertical gain are offered, each with the outstanding accuracy and repeatability that comes from a fully digital design. The Line Select provides a line marker in full-screen and thumbnail picture modes. 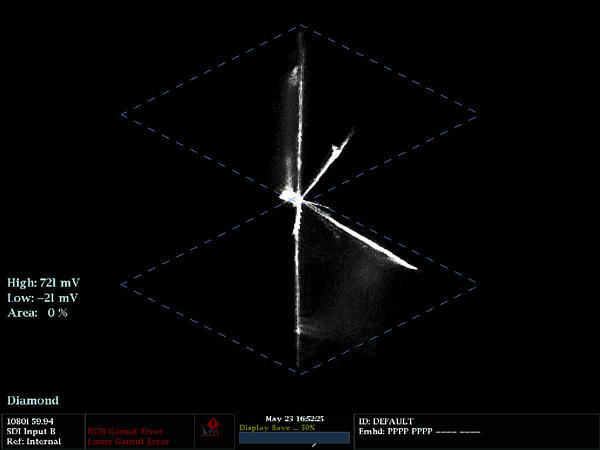 The vector display is offered with selectable 75% and 100% targets. Each display automatically selects the appropriate graticule based on the input format. 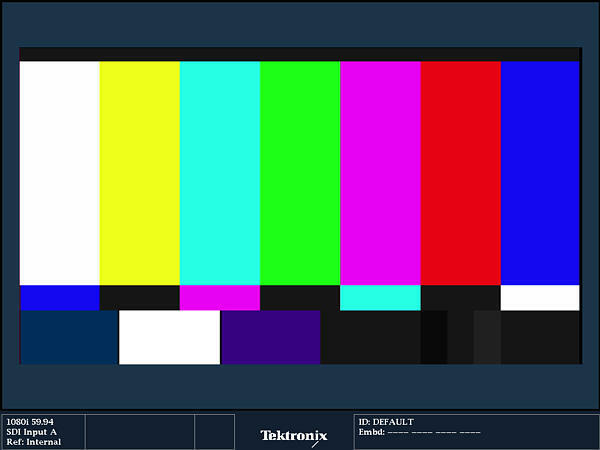 You can select brightup conditions that show the location of RGB or composite gamut errors on the picture display. The Line Select mode shows the location of the line currently selected within the picture display. Graticule choices include the Safe Action and Safe Title graticules defined in SMPTE RP218, ITU, and ARIB, standards, plus two sets of completely flexible, user-definable graticules. These graticules facilitate editing tasks and reduce the need for format conversions. The WFM5000 and WFM4000 offer a variety of displays designed to show status at a glance, in addition to the status bar continually displayed at the bottom of the screen. A comprehensive overview of the video content status is presented in the Video Session display. Offering a time-based compilation of information, this screen is ideal for presenting evidence of compliance after content screening. Information on input format and session time is presented, along with statistics on Error Detection and Handling (EDH) / Cyclic Redundancy Check (CRC) and Gamut errors. To support unattended monitoring applications, as well as provide documentation for service level agreements, these instruments maintain an error log of 10,000 events, which facilitates the detection and correction of problems. Log entries are recorded with date, time of day, and time code (VITC, LTC, ANC). The error log can be downloaded to TXT or HTM formats for easy record keeping and processing on spreadsheets or database software. Audio monitoring capabilities for both Digital AES and Embedded Audio are available as standard in the WFM5000 and WFM4000. The instruments feature Level Bars display and both Bars and Lissajous display. These displays can be selected to provide monitoring for both Digital AES and Embedded Audio formats with up to eight channels (2 channels for AES Audio). The level meters offer selectable meter ballistics and scaling plus they are user configurable. The Over and Silence settings augment digital clip and mute detection by letting users select levels to represent these conditions in the analog audio domain. The Audio Session display records the highest true peak, as well as the number of mutes, clips, overs, and silences during the session time. Tektronix instruments provide accurate peak level measurements. 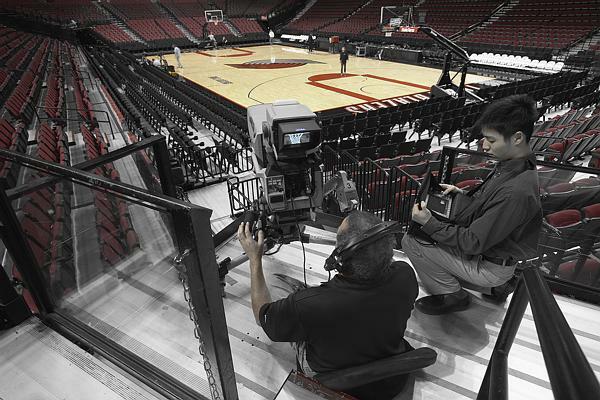 Synchronization is one of the most fundamental and critical procedures in a video facility. Every device in a system must be synchronized in order to successfully create, transmit, and recover video pictures and audio information. 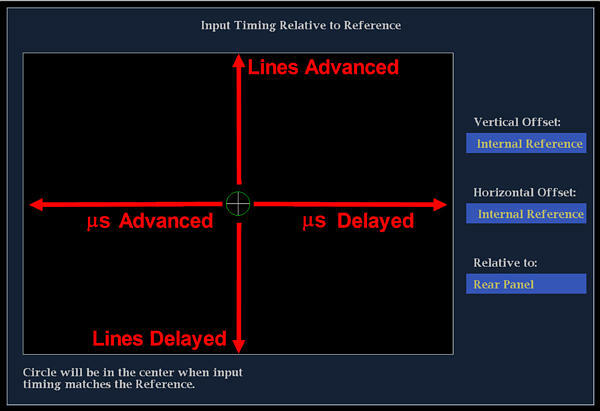 This intuitive display makes facility timing easy through a simple graphical representation which clearly shows the timing offsets between HD and SD signals relative to the reference. The patented Tektronix Timing display presents a unique timing comparison between a digital (SD or HD) signal and a house reference signal (composite or tri-level sync), thus eliminating the complexity in timing SD an HD signals. Timing differences are displayed numerically in terms of vertical lines and horizontal time in µs relative to the house reference signal. A simple graphical display shows the relative timing of the input signal (the circle) versus the reference signal (the crosshair). When the two signals are properly timed, the circle changes from red to green color and is concentric with the crosshair. The WFM5000 and WFM4000 waveform monitors accept a wide variety of input signal formats and external references. The following chart illustrates all the video inputs (first column), cross referenced with their compatible external references. *1 Available with the WFM5000 and WFM4000. *2 Available with the WFM5000 only. The monitor will automatically detect the signal format and establish the appropriate settings for the various displays. You can select an expected signal format from the list of supported formats. If the expected format and detected format differ, the instrument will report a format mismatch. The instrument will signal a format mismatch if the applied external reference format is not compatible with the input signal. Waveform Monitor with support for HD-SDI and SD-SDI Serial Digital Monitoring (2 passive loopthrough inputs). 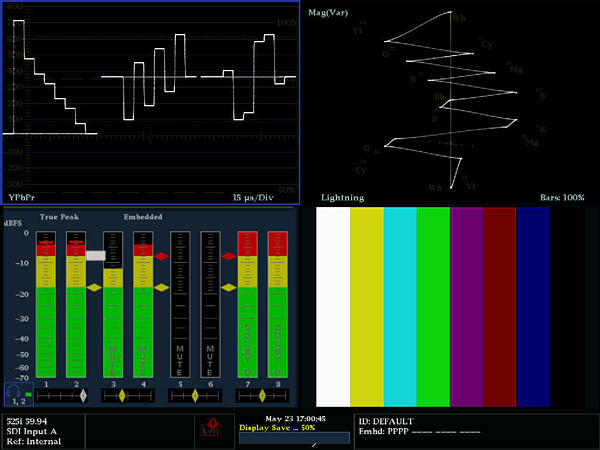 Digital audio monitoring in Embedded (16 channels) and AES/EBU (2 channels) formats. Uses same physical inputs for HD and SD – auto-detect between HD and SD. Note: Please specify power option when ordering. Waveform Monitor with support for SD-SDI Serial Digital Monitoring (2 passive loopthrough inputs). User Manual CD in English, Simplified Chinese, and Japanese is supplied with the instrument.